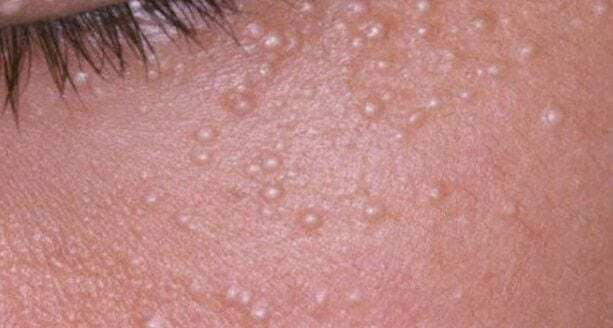 No White Spots or their medical name Milia are not usually dangerous. However, they may be an indication of another skin condition. As they often appear where there is skin damage. But our skin experts will confirm this during your skin consultation. And refer you to a Doctor if required. They often appear where there is skin damage. Commonly caused by over exposure to the sun. However, they can also be caused by the long-term use of steroid creams. Newborn babies often have milia white/yellow spots which clear up after a few days. And the condition is not thought to run in families and be hereditary. Who gets White Spots (Milia)? A large proportion of the adult population tends to have these spots. They are quite common. Some people may have just one. Whilst others may have many on different parts of their body. What are White Spots often called? The medical term is Milia. However, they are often referred to as cysts.